Guests are met at a location of their choice in central Paris** and transferred by private chauffeured minibus to the spacious Renaissance where a Champagne welcome with canapés awaits and time to meet your Captain and crew. We enjoy a short evening cruise to Briare, crossing Gustave Eiffel’s magical aqueduct over the River Loire, an amazing 10,000 ton, 662 metre structure, which was completed in September 1896. Dinner on board. Morning visit to a renowned winery in Sancerre, such as Domaine Henry Bourgeois, in Chavignol for a tour and private tasting. This medieval hilltop village overlooks a vibrant region which has known viticulture since Roman times. Alternatively visit the delightful, privately owned Chateau de la Bussierre known as the ‘Fisherman’s castle’ with its wonderful ornamental and vegetable gardens. 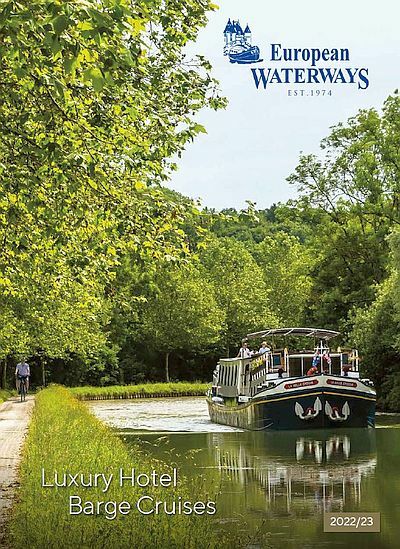 After lunch, we enjoy an afternoon cruise to La Gazonne, a beautiful mooring surrounded by lakes and ponds that provide water for the workings of the Canal de Briare. Here, our expert wine guide joins us to give an introductory talk on the vineyards of Burgundy and leads an on-board wine tasting. Dinner on board. This morning, your wine guide escorts you on a visit to Domaine Chatelain, a winery founded nearly 400 years ago on the right bank of the River Loire in St Andelain and maker of some wonderfully flinty Pouilly-Fumé wines. Here we enjoy a winery tour and of course, a private tasting. After lunch back on board the barge we cruise further along the canal, with plenty of opportunities for walking or cycling along the towpath, to our mooring at Rogny-les-Sept-Ecluses near its 350-year-old 7 lock-flight, which is well worth exploring. Dinner on board. After a leisurely breakfast of fresh croissants, baguettes and assorted pastries, we visit Gien, home of the Faience pottery, renowned for its beautifully decorated and vibrant dinnerware. There is also time to explore the bustling market. After lunch back on board, we enjoy a relaxing afternoon cruise to the lovely village of Montbouy. Dinner ashore at the Michelin-starred Auberge des Templiers in Les Bezards. An early departure after breakfast as our wine guide takes us on a tour of the vineyards and town of Chablis, dating back to Roman times, where we enjoy a private wine tasting at a winery such as the long-established Domaine Fevre. Owned by award-winners Nathalie and Gilles Fevre, the domaine makes the most of the region’s wonderful local terroir to produce high quality wines. We return to the barge for a slightly later lunch on board, then leave Montbouy for a gentle cruise to just outside the village of Conflans-sur-Loing and our peaceful mooring. Dinner on board. We enjoy a morning cruise through Little Venice, past flower-bedecked bridges and medieval watercourses joining France’s oldest canal. Our visit this afternoon is to the splendid Château de Fontainebleau, a national museum and UNESCO World Heritage Site. To walk through this palace is to walk through the history of France. It is the only royal and imperial château to have been continuously inhabited for seven centuries and every French royal family has added its own architectural style and features when in residence. Captain’s Farewell Dinner on board.